, one of the earliest writers of the Christian church, was born at Neapolis, the ancient Sichem of Palestine, in the province of Samaria. His father Priscius, being a Gentile Greek, brought him up in his own religion, and had him educated in all the Grecian learning and philosophy. 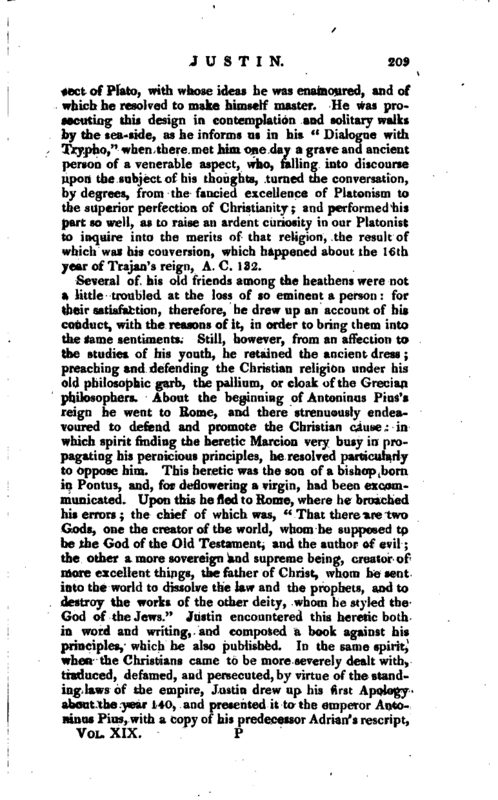 To complete his studies he travelled to Egypt, the usual tour on this occasion, as being the seat of the more mysterious and recondite literature at this time he was shewn, as he tells you, at Alexandria, the remains of those cells where the seventy translators of the Bible performed what is called the Septuagint version. He had, from his first application to philosophy, disliked the stoic and peripatetic; and chose the | sect of Plato, with whose ideas he was enamoured, and of which he resolved to make himself master. He was prosecuting this design in contemplation and solitary walks by the sea-side, as he informs us in his “Dialogue with Trypho,” when there met him one day a grave and ancient person of a venerable aspect, who, falling into discourse upon the subject of his thoughts, turned the conversation, by degrees, from the fancied excellence of Platonism to the superior perfection of Christianity; and performed his part so well, as to raise an ardent curiosity in our Platonist to inquire into the merits of that religion, the result of which was his conversion, which happened about the 16th year of Trajan’s reign, A. C. 132. Several of his old friends among the heathens were not a little troubled at the loss of so eminent a person: for their satisfaction, therefore, he drew up an account of his conduct, with the reasons of it, in order to bring them into the same sentiments. Still, however, from an affection to the studies of his youth, he retained the ancient dress; preaching and defending the Christian religion under his old philosophic garb, the pallium, or cloak of the Grecian philosophers. About the beginning of Antoninus Pius’s reign he went to Rome, and there strenuously endeavoured to defend and promote the Christian cause: in which spirit finding the heretic Marcion very busy in propagating his pernicious principles, he resolved particularly to oppose him. This heretic was the son of a bishop born in Pontus, and, for deflowering a virgin, had been excommunicated. Upon this he fled to Rome, where he broached his errors; the chief of which was, “That there are two Gods, one the creator of the world, whom he supposed to be the God of the Old Testament, and the author of evil; the other a more sovereign and supreme being, creator of more excellent things, the father of Christ, whom he sent into the world to dissolve the law and the prophets, and to destroy the works of the other deity, whom he styled- the God of the Jews.” Justin encountered this heretic both in word and writing, and composed a book against his principles, which he also published. 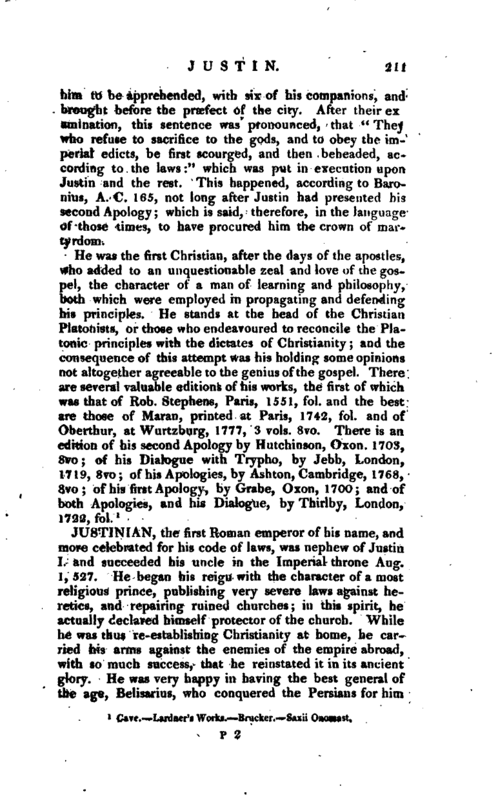 In the same spirit, when the Christians came to be more severely dealt with, traduced, defamed, and persecuted, by virtue of the standing laws of the empire, Justin drew up his first Apology about the year 140, and presented it to the emperor Antoninus Pius, with a copy of his predecessor Adrian’s rescript, | commanding that the Christians should not be needlessly and unjustly vexed. This address was not without its success: the emperor, being in his own nature of a generous disposition, was moved to give orders that the Christians should be treated more gently, and more regularly proceeded against. Not long afterwards, Justin made a visit into the East; and, among other parts, went to Ephesus. Here he fell into the company and acquaintance of Trypho, a Jew of great note, with whom he engaged in a dispute that held for two days: the substance of which he afterwards wrote in a piece ^entitled his “Dialogue with Trypho.” By the conclusion we learn he was then ready to set sail to Ephesus. He returned at last to Rome, where he had frequent conferences with one Crescens, a philosopher of some repute in that city; a man who had endeavoured to traduce the Christians, and represent their religion under the most infamous character. Justin now presented his second Apology to Marcus Antoninus Philosophus, the successor of Pius, and a determined enemy to the Christians. 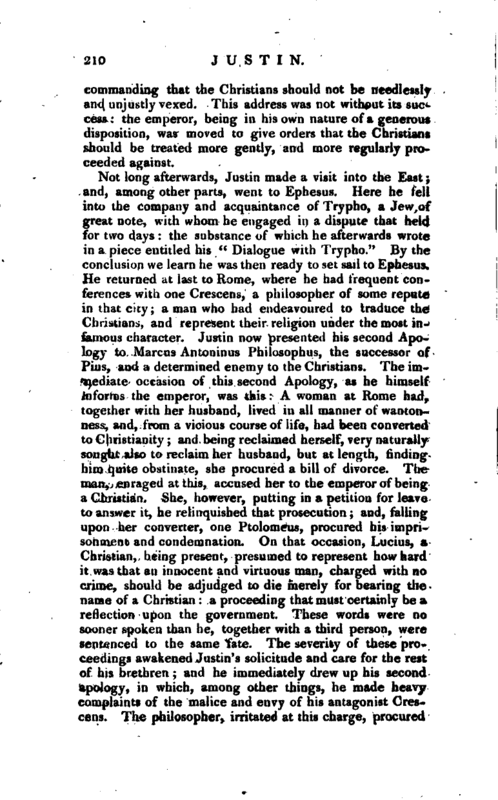 The immediate occasion of this second Apology, as he himself Infoniis the emperor, was this: A woman at Rome had, together with her husband, lived in all manner of wantonness, and, from a vicious course of life, had been converted to Christianity; and being reclaimed herself, very naturally sought also to reclaim her husband, but at length, finding him quite obstinate, she procured a bill of divorce. The man, enraged at this, accused her to the emperor of being a Christian. She, however, putting in a petition for leave to answer it, he relinquished that prosecution; and, falling upon her converter, one Ptolomeus, procured his imprisonment and condemnation. On that occasion, Lucius, a Christian, being present, presumed to represent how hard it was that an innocent and virtuous man, charged with no crime, should be adjudged to die merely for bearing the name of a Christian: a proceeding that must certainly be a reflection upon the government. These words were no sooner spoken than he, together with a third person, were sentenced to the same fate. 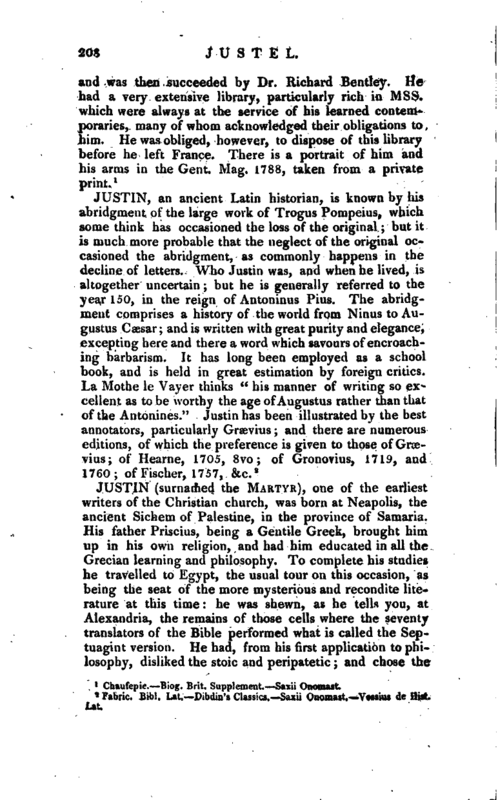 The severity of these proceedings awakened Justin’s solicitude and care for the rest of his brethren; and he immediately drew up his second apology, in which, among other things, he made heavy complaints of the malice and envy of his antagonist Crcscens. The philosopher, irritated at this charge, procured | him to be apprehended, with six of his companions, and brought before the praefect of the city. After their ex amination, this sentence was pronounced, that “TheJ who refuse to sacrifice to the gods, and to obey the imperial edicts, be first scourged, and then beheaded, according to the laws:” which was put in execution upon Justin and the rest. This happened, according to Baronius, A. C. 165, not long after Justin had presented his second Apology; which is said, therefore, in the language of those times, to have procured him the crown of martyrdom. Cave. Lardner’s Works. Brucker, —Saxii Onomast.